Owen Hughes is a freelance Sound Recordist and CASA Certified Drone Pilot based in Perth, Western Australia and is available to work within Australia and internationally. 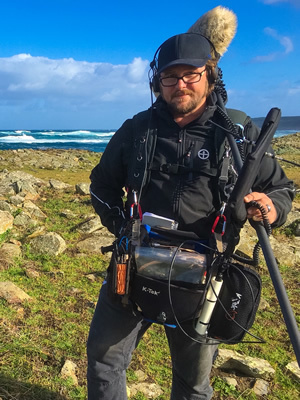 He has been actively involved in location sound recording for film and television for over 9 years and has extensive experience in remote location filming on land, sea and in the air. Working on various projects across Australia as well as internationally, he is equipped with professional equipment from Sound Devices, Lectrosonics, Sennheiser, Neumann and Ambient and is capable of working seamlessly in even the harshest conditions. Owen has recorded on long and short form drama, documentary series, corporate productions, reality, ENG and TVC’s. Through his work he has built strong relationships with Australian production companies as well as international clients. In 2015 Owen obtained his CASA RPA (Drone) Controllers Certificate and has flown drones on several productions since that time. Owning an Inspire 1 Pro, he is able to work as a Location Sound Recordist and also operate as a Drone Pilot for productions. The DJI Inspire 1 Pro allows for a camera operator to have independent control of the camera on the aircraft while Owen flies. This enables a greater variety of options when recording aerial photography on location.